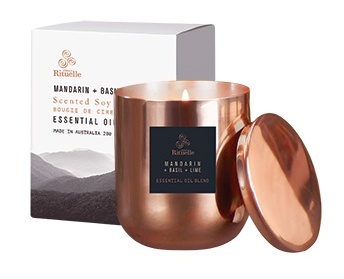 This crisp, uplifting scented soy candle is hand poured into a sleek copper vessel, with matching lid. Handcrafted in Sydney with pure, natural wax & a premium cotton wick, this luxurious candle will purify your senses & nurture you with its scented warmth & light. Bursting with the scent of mandarin, basil & lime, this candle is the ultimate in luxury home fragrance. Burn time approx. 60 hours.